How can Libreria Borges become an “artistic work”? The chinese government has been focusing on economic during these 30 years’ development, maybe only Libreria Borges,which is now totally a “private enterprise in the red deficit”, established the new cultural values under the guise of business. But, in terms of contemporary culture, it always plays the role of lighthouse in the darkness. Different from other distinguishing bookshops in the world, Libreria Borges was born inside the art, in other words, not taking serving the artists and selling art and literature books as its business strategy, it tried to make itself an art . That’s the raison that Libreria borges has engaged in so many art and literature activites since 1994 and it has made great efforts for spreading french contemporary thoughts and works—for example Gilles Deleuze and Alain Robbe-Grillet –everywhere in China. To deal with the global financial crisis, the chinese government laid down a series of measures, including the policy “home appliances going to countryside” aiming at activate consumer markets in rural areas. This policy influenced less comparing with the investments in infrastructure at the same period. In the eyes of intellectuals, the main problem of ruralchina is education, not only educating the children, but also helping the peasents to release from the feudal ideology. Libreria Borges has not taken the rural area as its enlighting object, but it imagines when a rural child get in touch with contemporary thoughts, something will be changed, for example, he will love much more the fields instead of leaving them. Libreria Borges has a country planning which has not been put into effect yet, this planning is about setting up bookcases in middle schools in ruralchina. The books on the bookcases, which can be completely considered as heterodox , will be in opposition of the official textbooks. This circumstance is possible to appear only in such a complicated society like China. Chen Tong, interested by the “home appliances going to countryside”, recalled the “postmen in mountain village” , the “barefoot doctor”and “film projection teams in the country”, what he saw when he was a child. At the same time, he was inspired by Dr. Norman Bethune, a member of the Communist Party of Canada, around fifty he was sent by the Communist Parties of Canada and the United States to China to help us in our War of Resistance Against Japan. For facilitating working in mountain village , he invented a kind of arched medicine chest. Which can be put on the donkeyback. 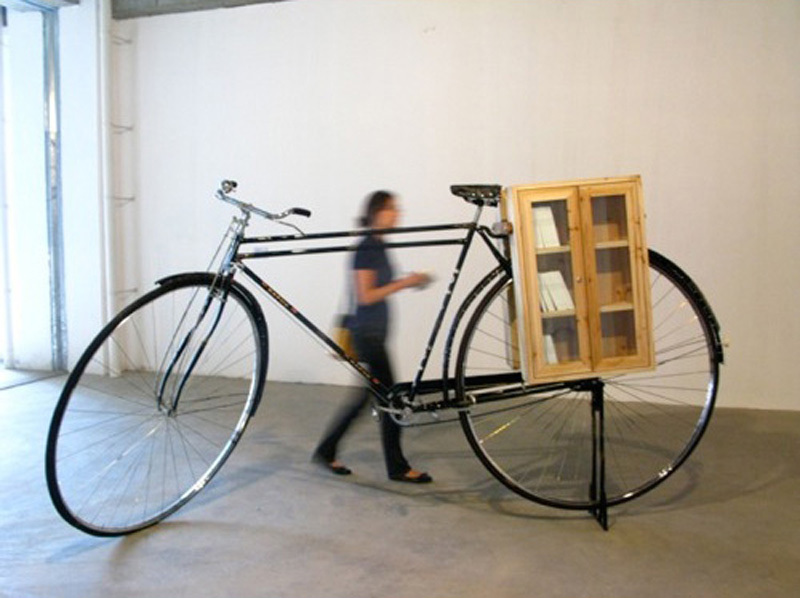 Chen Tong changed the madecine chest into book chest, contradictorily , in the book chest were books named The idea of the uselessness of study. These books have only a name and blank pages. Many years ago, Chen Tong set up in his bookshop a billboard written “The idea of the uselessness of study”, he wanted to explain ,through this paradox, his bookshop’s role or function in the contemporary culture. 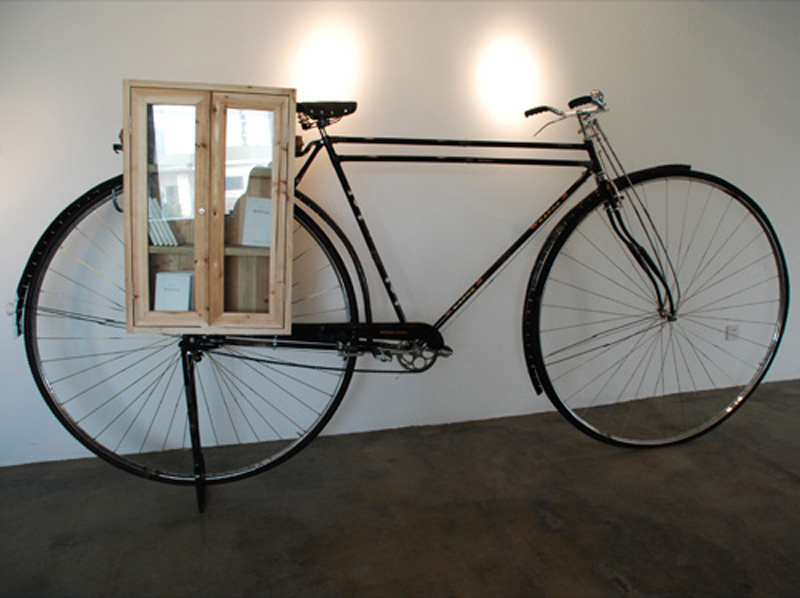 It seems that the idea of modifying two bicycles into one is not only inspired by Dr. Norman Bethune but also Picasso or some others. 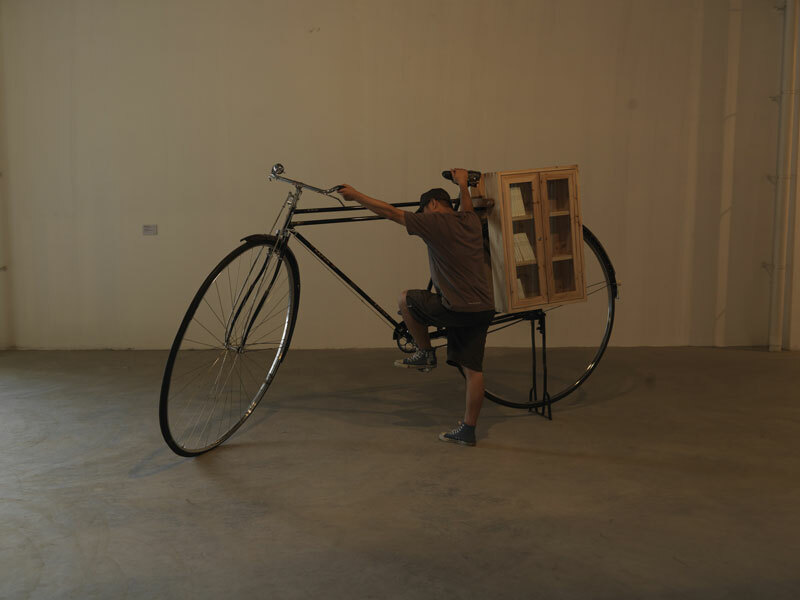 Chen Tong concieved this “reinforced” bicycle whithin a very short time, maybe he ridiculed with some customs of his own cultral traditions, for example irrationality, imitationand, huge-crowd strategy, etc. Some one asked him if this big bicycle can be ride, he answered yes, Yao Ming can ride it. This is one thing that exists theoretically, but in reality we just imagine it. That’ why Chen Tong takes this piece– “Libreria Borges learn from comrade bethune planning—thoughts going to countryside”—as the representation of the reality and values of Libreria Borges.